Arizona artist Bill Anton is very highly respected in the Western art community. 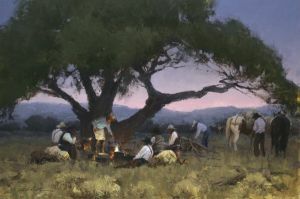 "Twilight at Cottonwood Camp" is a particularly outstanding painting featuring a community of cowhands beneath a massive cottonwood tree. The viewer is welcomed into the camp as another cowhand. Enjoy the fire, smell the coffee and perhaps sing along later in the evening as the guitar is brought out.